Deeg Palace in Bharatpur used to be the summer resort of Bharatpur Kings. Built in 1772 by King Suraj Mal , Deeg Palace is built with the blend of rajput and mughal architecture. The design of the gardens has been inspired by the Mughal Charbagh. The palace forms a quadrangle with a garden and walkways at its centre. Decorative flowerbeds, shrubs, trees and fountains cool the place considerably during summer. It is one of the famous tourist destination in Bharatpur. The architecture of Deeg is mainly represented by the mansions called the Bhawans popularly known as Gopal Bhawan, Suraj Bhawan, Kishan Bhawan, Nand Bhawan, Keshav Bhawan, Hardev Bhawan. The striking features of these palaces are balanced outlines, fine proportions, commodious halls, attractive and logically disposed arcades, alluring greenery, charming tanks and canals with fountains. The layout of Deeg gardens is based on formality of the Mughal Char bagh or four fold garden patterns and flanked by two reservoirs called namely Rup Sagar and Gopal Sagar. The architecture is primarily of trabeate order, but the use of arcuate system has also been made in certain instances. Mostly the arcades are of a decorative quality as each arch is formed by joining spandrel shaped slab cantivelers projecting from the pillars. The general features of this style are engrailed arches resting on ornate pillars, hypostylar halls flat roof terraces, balconies and pavilions with Bengal roofs, double eaves, moderate structural heights and spacious internal arrangements. Deeg Palace is open 9 am to 5 pm except on Fridays. 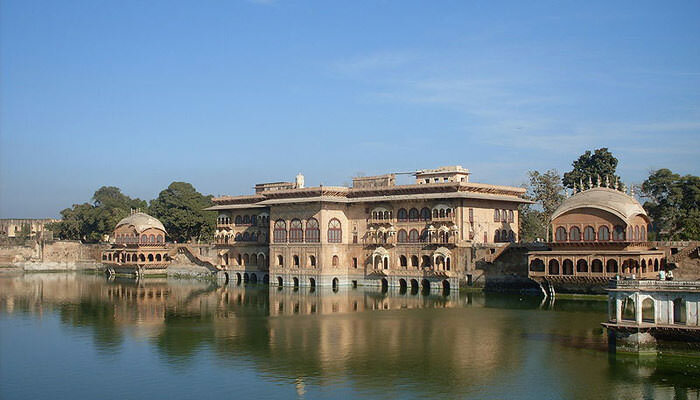 Deeg Palace is located about 37km from Bharatpur City. Agra Airport is the nearest airport while the nearest railway station to the palace is Bharatpur Junction. Deeg is four hours by road from Delhi, two hours from Agra and one hour from Mathura.